Mount Sunapee - Taxpayers for Cannon - Save Cannon Mountain ski area! After years of planning and debate, Mount Sunapee ski area was opened by the State of New Hampshire on December 26, 1948 with a single chairlift. Over subsequent decades, millions of taxpayer dollars were invested in the ski area. Even after these investments, the area was not self sufficient. During the 1997-1998 ski season, the state government operated Mount Sunapee ski area recorded 110,000 skier visits. At this point, the ski area's aging lift system included 3 triple chairlifts and 3 double chairlifts. On July 1, 1998, the State of New Hampshire leased Mount Sunapee ski area to Tim and Diane Mueller, best known for developing Okemo into one of the most successful ski areas in New England. By the end of the 2000-2001 ski season, privately-operated Mount Sunapee ski area recorded 258,000 skier visits. The ski area's lift system now included one high speed quad chairlift, 2 fixed grip quad chairlifts, 2 triple chairlifts, and 1 double chairlift. 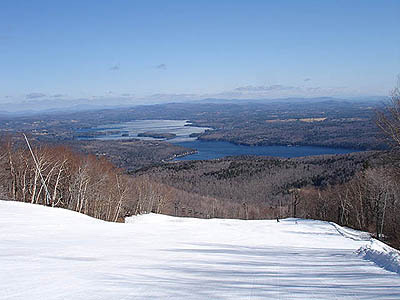 During the 2010-2011 ski season, privately-operated Mount Sunapee recorded 288,000 skier visits, making it the second most popular ski area in New Hampshire. Through October 2013, the private operators have paid the state $6,840,168 in lease fees. 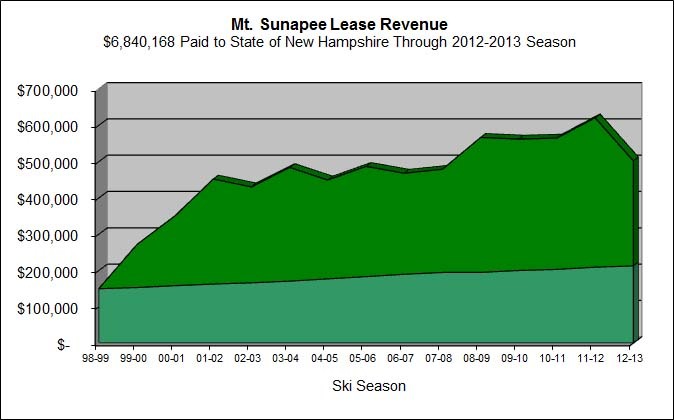 Mount Suanpee's operators have also paid millions of dollars in municipal taxes, school taxes, county taxes, state Business Enterprise Taxes, and state Business Profits Taxes, none of which government-run Cannon Mountain Ski Area pays. In addition, Mount Sunapee's private operators have donated hundreds of thousands of dollars to education, environmental, arts, and local medical organizations.